California has led the nation since the early '70s with sometimes controversial regulations designed to lower energy consumption in homes and commercial buildings. The results are clear. Residents and businesses have avoided billions of dollars in energy expenses, and the state continues to have a per capita electric consumption far less than the rest of the nation. And that fact is not climatically fudged. California has one of the nation's most difficult electric peaks from air conditioning and high population density in hot summer weather. The state's Energy Commission has been the lead agency in researching ways to integrate new materials and technologies into standard and exotic construction practices. California was certifying the proof of green building practices long before they became recognized through the LEED Program (Leadership in Energy and Environmental Design) became known throughout the U.S. The state forced utilities to field battalions of energy auditors into both residential and commercial buildings to identify the lowest hanging fruit of energy conservation. It's appliance standards led the nation for years, but its market size forced manufacturers to take those standards seriously. The early 1990s saw a utility-sponsored competition called the SERP (Super Energy efficient Refrigerator Program) with a million dollar prize to the manufacturer whose refrigerator had the lowest use. That led to the latest generation of energy sipping refrigerators. Many mid-to-larger models use only half the annual kilowatthours they used to. (Left, and Above) California has great variation in topography and climate. Climate zone 16 is the toughest in winter and zone 15 in the lower Colorado River Basin is the hottest region in the U.S. Daytime highs reach 125°F. Degree days of heating (and cooling) tell the story of climate for home designers and builders, and are good predictors of insulation needs, and home heating/cooling performance. 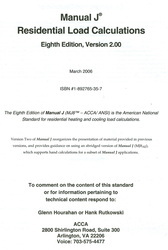 (Below) Excerpt from ASHRAE tables for Heating Degree Days, expressing severity of the heating season. For an illustration of climatic variation, compare Los Angeles, CA (Sea Level) with Alamosa, CO (7,500 feet). Build your house there accordingly. For a house to be efficient, its design must consider climate issues for its location (as featured above). Once a decision is made that the heating/cooling system will be an automatic one, driven by a thermostat, and based on ducted air flow (in other words, conventional) certain steps are imperative. This is even more important if the heating is to be of the radiant variety, carried by hot liquids, imbedded in floors. HVAC systems share some performance and efficiency characteristics with autos and trucks. Want the highest mileage? Then, travel flat roads to haul your people or tow your cargo. Don't drive at variable speeds, take a route that is peppered with stoplights, or over-accelerate and have to brake heavily between those stoplights. When towing up hills, locate the best gear and let the engine perform at its best torque output. The comparisons continue in more detail, but installing a too small heating/cooling unit will work it too continuously and too hard for the job. And installing a too big unit will cause it to meet the thermostat's calls too quickly, resulting in a "stop and go" operating cycle that will sap its efficiency potential and cause strong drafts and poor humidity control in summer. How does one steer clear of either of these extremes? You should make sure that your builder knows not only the structural dimensions of your planned house, but the exact materials it is made of in terms of framing, windows, siding and insulation. 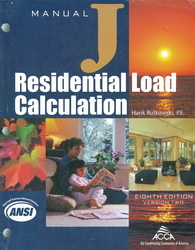 This information will enable a complete heating/cooling load calculation for the building. This is performance modeling on paper before the foundation is ever poured. 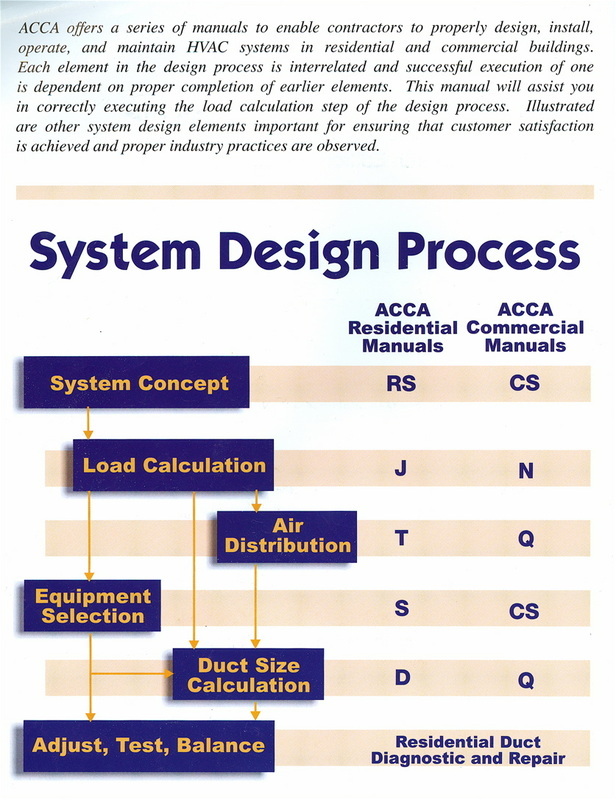 Only when this load calculation is known can anyone accurately specify the size and operating design of your HVAC system. Installations of this kind are referred to as Mechanical systems, and the preparatory work here is called Mechanical Engineering. Fortunately, the best professional HVAC installers will use these techniques. Unfortunately, there are still some out there who don't, and to defend against their receiving complaints and call-backs from you or your general contractor— they'll intentionally oversize your equipment, taking you to guaranteed inefficiency as well as higher first cost. I call these folks, "cookie cutter contractors." If it's a conventional 3 BR 2 BA home of 1700 sf, they put in a 75,000 BTU/hr unit, period. 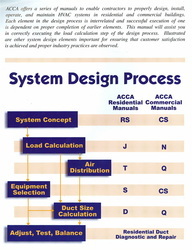 ACCA (The Air Conditioning Contractors of America) produces a whole set of mechanical engineering guidebooks for contractors that cover all aspects of this work for residential and commercial buildings. 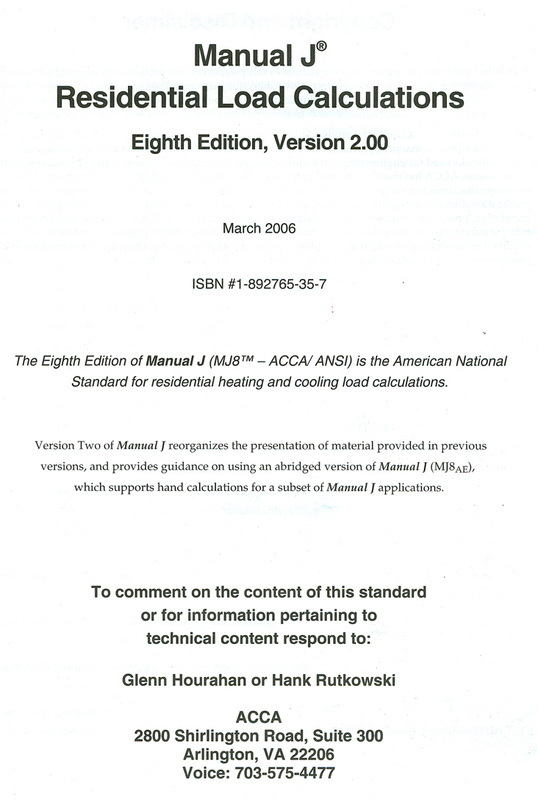 The edition featuring heating and cooling loads is called Manual J, and it's featured in the gallery below. Many people are finding it better to remodel their existing home than to build a new one in another location. Those with experience at this will advise considering moving out during this work (depending on its scope and complexity). Either way, the choice to alter existing buildings should be seen as an opportunity for improvements in energy efficiency. Whether or not you are adding net, new space to the building, be sure to build any new portions to current weatherization standards whether or not it is required in your community. Any opening of wall, ceiling or floor cavities in your existing building should be finished with better insulation, windows, and air sealing techniques unless your house has been built in the last ten years. And, in keeping with good mechanical practices (as covered, just above) be sure that if you're breaking into existing ductwork or upgrading equipment that overall new heating and cooling loads are considered before you begin. Retrofitting of buildings to lower energy use is still an institutionalized activity and the state's electric utilities all have programs to assist homeowners. Significant tightening of new residential and commercial standards for new construction now build "weatherization" into buildings from the start. New emphasis on daylighting, solar tube fixtures, heat recovery ventilation, and others mark continued increases in building efficiency and savings at little up front cost at the time of construction. Though no regulations in California demand it (yet), those on the cutting edge in this state and in others are happy to chase the "zero net energy home" concept, in which on-site generation of electricity by renewables reduces the average annual consumption to zero kilowatthours. (More can be found in this Web site's section on Photovoltaics) Attention to thermal details, careful use practices, the the deployment of solar PV and/or wind turbines often makes this possible. This points the way toward a future with more dependence on renewable sources of energy and dispute's the late Ronald Reagan's insistence that "Energy conservation means freezing in the dark."